The U.S. economy may technically be in a recovery, but it likely doesn’t feel that way for many Americans when grabbing for their wallets. Median annual household income has fallen more during the recovery than it did during the recession, according to a new study from former Census Bureau officials Gordon Green and John Code. The lack of income growth may explain why for most Americans the recovery still feels like a recession. Eight in 10 Americans believe the recession is an ongoing problem, according to a recent Gallup poll. And workers don't anticipate things will pick up any time soon. Nine out of 10 Americans said they don't expect to get a raise that will be enough to compensate for the rising costs of essentials like food a fuel, according an American Pulse survey released in June. Slow job growth is likely also exacerbating the feelings of recession and weighing on household incomes. U.S. employers added 103,000 jobs in September, too few jobs drive the unemployment rate below 9.1 percent and barely enough to keep pace with population growth, the Department of Labor reported last week. Those Americans that are employed are continuing to get squeezed by their employers with wage stagnation and benefit cuts, while profits per employee went up for the second year in a row in 2010, according to financial analysis company Sageworks. While American workers find them selves under increasing pressure, American corporate profits are surging again in 2011 as corporations horde those profits in bank accounts. Corporations were sitting on $2.2 trillion in cash at the end of June, and that number has grown during the last quarter. If giving tax cuts to corporations and the ultra-wealthy is the most stimulative approach to boosting jobs and wages, as Republicans claim in rejecting Pres. Obama's Jobs Plan, then the economy should already be racing, given the trillions of dollars in tax cuts President Bush and Republicans handed during the eight years of Pres. Bush's administration. Right? Wrong! If the U.S. continues its sluggish jobs growth pace it could drive incomes even lower. Americans who are jobless for more than 99 weeks lose any unemployment benefits driving their incomes to zero and weighing on the national average, according to 24/7 Wall Street. The recession’s and the recovery’s drag on income growth has put some Americans in a worse position than they were decades ago. The median income for U.S. males was worse in 2010 than in 1968 on an inflation-adjust basis. In some states the recession and the recovery only exacerbated a decline in incomes that’s been taking place for longer. The median household income in Wisconsin plunged 14.5 percent between 1999 and 2010, The Milwaukee Wisconsin Journal Sentinel reported. 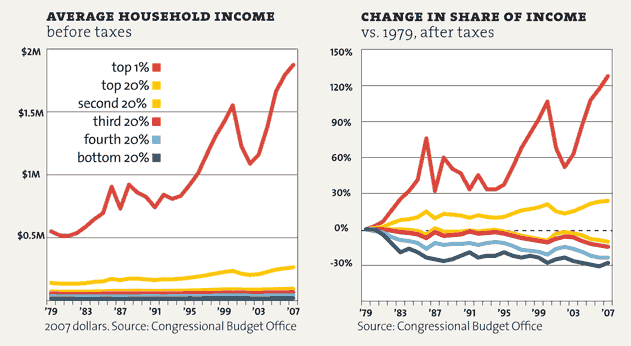 The super rich have grabbed the bulk of the past three decades' income gains.